Long ago, the twin kingdoms destroyed each other in war. The White Kingdom was rebuilt with magic, but the Black Kingdom is still cursed - dark clouds envelop the sky, and dangerous vines destroy fields and houses. The noble Queen Mariette in the White Castle looks after her own subjects, but also supports the suffering inhabitants of the dark land. During your dangerous journey you will meet the inhabitants of both the White and Black Kingdoms. It won't be immediately clear who is truly trustworthy. The boundaries between good and evil, magic and technology, and black and white will begin to blur, and the fate of the two kingdoms - and your son's life - will be in your hands. Will you work with the most unexpected allies? 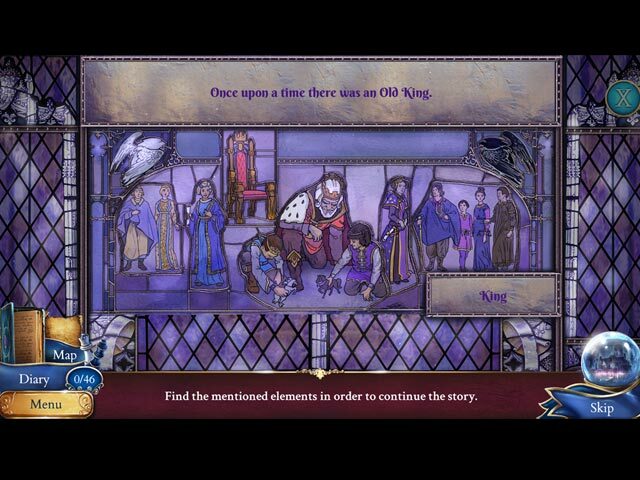 Will you stop the evil and solve the mystery of the royal blood? 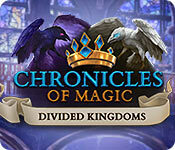 Chronicles of Magic: Divided Kingdoms is rated 3.1 out of 5 by 16. Rated 5 out of 5 by gyanda from Excellent game Everything in this game is really great, graphics, sounds, storyline - nothing to complain at all! I enjoy playing this game very much - and encourage all players to try the demo to find out whether they like it as much as i do. Rated 4 out of 5 by ChrysP from What a surprise for an SE game! What was really annoying--let's get that out of the way early--was seeing all the collectibles, but since I was playing the SE version there was no way I could collect them! The game is a lot of fun, and good HOGs. It was a good length, and since there was no Bonus game, that was surprising! The issue of it not being a CE though, meant there was no way to "cheat" by looking at the Strategy Guide. Couldn't find a walkthrough when I hit a wall, but there was a video showing how to play the game. Really liked the recipes, trying to figure out what was needed ingredients-wise, and knowing when to use the scrolls. A lot of fun! Thanks! Next time I'll look for and try the CE version! Rated 4 out of 5 by ninja226 from Nice game, worth a try This is a nice game and definitely worth a look. Granted, it does not have a lot of special effects and pizazz, but the story is good. Puzzles are not hard. HOPs are standard. Expert mode allows Hint, skip & helpful messages, but 90% of actions to progress are easy to intuit, making for excellent sleuthing experience. 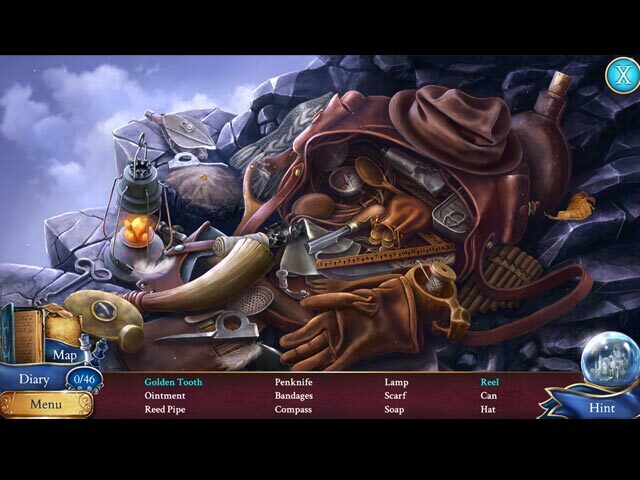 There are magical scrolls (bottom right) that need to be used in some scenes, and a third of the quest is finding ingredients for the magic scroll. The only thing that could have been better is the artwork, which is OK, but not spectacular. The devs are on the right track for creating great HO games, with a lit bit of improvement in artwork and special effects category. Rated 4 out of 5 by lamp_post from Cute Game - Fun To Play I am not certain when this game first came out. But I do remember playing the demo before. This time when I finished the demo I still had 33 minutes left leading me to believe this is an older game when the demo was 1 hour. That said I do like the game. It is fun but not real challenging. I did not care much for the graphics. A lot of it is cartoonish. I liked the story line and the mini-games. All in all it is a good way to pass a few hours. I will purchase it with a coupon. Try the demo and see what you think. You may be surprised by this cute game. Rated 4 out of 5 by janechurch from Could it be magic? A collector's edition without the price, this is a great little adventure for those of us who love a bit of magic and colour in our games. I unashamedly love this sort of thing, and make no apologies. Suitable for all ages, you jump from stunning scene to scene while you try and find your kidnapped son. I know, it has all be done before but give this game a try for a bit of enjoyable escapism! 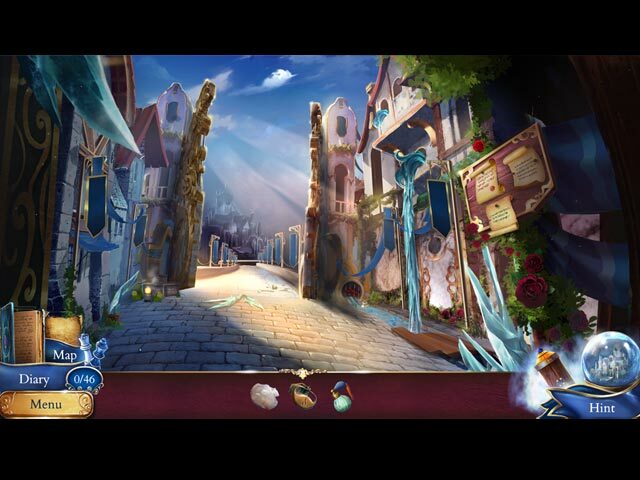 With the same visual quality of Persian NIghts: Sands of Wonder, this is a standard game with extras. The fact that my download did not include these is an ongoing irritation, which is why I have not given this game a 5. Rated 3 out of 5 by LunaNik from 5-star game for kids, but too easy for adults. This is an adorable game for kids, but it's much too easy for adults. The HO scenes are interactive lists, and the mini-games seem to be geared toward children, given that the repeating puzzle to activate the magic scrolls is a simple connect-the-dots. The production is quite Disneyesque. While the graphics aren't photorealistic, scenery, characters, and objects are well-drawn and recognizable. Voiceovers are excellent, except the child, who was clearly voiced by an adult. The music is perfect for a light fantasy like this. The storyline is a classic good versus evil fairy tale. I recommend this game for kids, beginners to the genre, and those looking for a lighthearted, relaxing game. Rated 3 out of 5 by cyndrap from Not too bad but not a buy for me I finished the demo and it is a familiar game with same old same old story line, HO, mini-games, nothing new or unique. I have a free game credit to use and thought this might be a good game to use it with but alas no. The colors and graphics are good The music is repetitive and the voice overs were just terrible. I finally muted the sound to not have to listen to the dialogue. I cannot recommend this game, but try it for yourself. Rated 3 out of 5 by judy76073 from somewhat disappointing I actually don't mind the game - graphics and sound are quite good, it has a jump map (which I always find quite helpful). Major disappointment, though, it calls for collectible ravens and chess pieces - however, these did not download with the game. oh well, I will still enjoy the game anyway.